Law firm partners and corporate general counsel are all lawyers, but they practice law in very different worlds. Whether the issue is hourly rates, cost cutting, governance, or other measures, corporate culture is focused on organizational performance and values. In many ways, GCs today are well positioned to make organizational performance contributions. They have a much larger budget for legal fees than ever before and increasingly are using it to "purchase" legal talent at wholesale (as an employee of the legal department) rather than retail (law firm associate or partner). In many cases, GCs are increasing the internal emphasis on their legal departments as one way to control legal costs and impact organizational profitability. That gives them a greater degree of respect within their own organizations for cost decisions. Such increased clout was the focus of a listserv discussion in which I recently participated. European legal consultant Jeffrey Forbes shared information on his forthcoming study of how the legal department in a U.S.-headquartered global company is generating revenue for the company and actually is turning a profit after paying for the entire overhead of the global legal team, plus expenses for outside law firms. By being proactive and uncovering ways to generate revenue and create efficiencies in legal services and other operations within the company in effect makes this legal department a profit center and no longer a cost center. Forbes added the telling comment that he has found few major U.S. and European law firms interested in this example; only firms in the still-developing economies of Eastern Europe seemed excited by it he asserts. For my part, I replied that the concept of a lawyer acting like a business person was indeed fascinating. From my experience, if one percent of GCs in the world can fit this bill, it would be a percentage higher than I would expect. And, I think this scenario is rife with potential internal conflict. The CEO and CFO might like it, but I am not sure how many division leaders would appreciate their lawyers pursuing revenue enhancements rather than cost efficiencies. On the other hand, preventive law practices, as in suggesting to corporate leaders what they might do to reduce risk, is a role that in-house lawyers with a progressive attitude are very qualified to assume. And to take the corporate savings/revenue enhancement right to the bottom line benefits everyone - except the company's outside law firms. GCs have made it clear that they want more professionalism about fees, better communication between themselves and their law firms, and less emphasis on increased profits per partner. Law firm per-partner profits of $4 million and more, and billing rates of over $1,000 an hour, may have created a backlash from which there will be no escaping. I'm in a conference this week of like-minded, high-powered consultants, addressing the topic of "thought leadership." Among the select group of participants is Marshall Goldsmith (author of MOJO, among others) and Alan Weiss (author of Million Dollar Consulting, among others). Both of these books are "must reads" in my opinion. 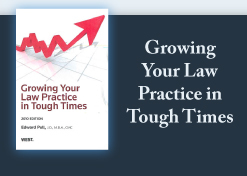 What are you doing in your practice that differentiates you from the one million attorneys in our country? How can you provide value to your clients that sets you apart? How can you create an environment for yourself that enables you to be both happy and meaningful? A simple question, but not so simple to answer. The good part, though, is that only you can answer this question. There is no outside standard—it's all within you.